The D.I.Y. Forum is a feature in WarioWare: D.I.Y. where the player can read message board posts made by Diamond City residents. The posts range from tips on content creation and game unlocking to random humor and promotion of WarioWare: D.I.Y. Showcase. Threads are unlocked based on actions in the game (such as completing the tutorials or unlocking new content). Please note that names and dialogue are taken from the NTSC-U version of the game. Names and dialogue may differ between the NTSC-U and PAL versions. 2.1.7 HUGE Sound FX Discovery! 2.1.8 Turn up the volume! 2.1.12 Need moar sound effects!!! 2.2.2 Do comics really NEED art? 2.3.1 MakerMatic hits the big time! 2.3.4 A new challenger appears! 2.3.9 Import saves the day! 2.3.10 I'm goin' for the big time! 2.4.1 Making games is HARD! 2.4.5 Cartridge label easter egg! 2.6.3 Any luck with Hum mode? 2.7.1 Play on Wii, too! 2.7.3 How many can you send? 2.7.4 Play on Wii? HOW?! D.I.Why: How old are you, Sparkles? SureTire: Disabling taps after the game's lost is WAY too much work! Why did Crygor let this thing out the door with flaws like?!?! KAGE: make art with two identical cels, play the art once when tapped, then play sound when the art's done playing. how's that? John Sun: If you set a sound effect on a continuous trigger, it just keeps starting! It sounds really weird! Is there a good use for it...? VROOM: Maybe, like, for a buzzer? John Sun: Yeah, maybe. But it still sounds awful! Javier: Hey, kids, you can scroll AI notes with the +Control Pad or the X and B Buttons. Phonee: I NEVER would have tried that, Javier! Major props! SureTire: AI notes? That's where you can just read all of an object's AI at once, right? a + b: There's this neat thing I like to do when placing objects or framing stuff. I hold the L or R button down, and I can move and place things precisely, click by click. D.I.Why: This is a pretty popular feature. It's not just you. John Sun: Check this out: I had an object play a sound effect as it went from left to right. The sound effect played from left to right, too! Stereophonic, whoo! Sparkles: Nice! I just figured out that if you play the same sound effect twice at the same time, it plays louder! D.I.Why: Oooh, really?! Got to try that soon! Good find! KAGE: I hadn't heard that! I love you, Sparkles! Sparkles: I set triggers, but I'm not sure if they're really being activated! How can I check? KAGE: Set sound effects as actions in the AI! That'll tell you if your triggers work! AAAaaah: Are you single, Sparkles? a + b: If you want to place an object out of sight but still see its switch, put it just off the bottom of the stage. You can't see the object, but the switch still peeks up a bit. yogaguy: You can make switches visible? Is that what that button next to Play does? a + b: Making backgrounds, it can be tough to visualize where everything will go. Try sketching your objects right into the background, then place your objects on top. You can go back and remove the sketches later. D.I.Why: Yikes. Control freak much? AAAaaah: Gah! I need a sound effect for lasers, but nothing fits! Sparkles: Hmm... Have you tried playing the 8-Bit Power Down and Computer Falling sounds at the same time? AAAaaah: That sounds really good! Thanks, Sparkles! You're a sound-design genius! SureTire: I get that you can change the order of your AI, but why would I want to? T-shirts: It may seem silly, but the order of your AI can actually change how your objects move! Try it! a + b: Yeah, it can be a pretty big deal. Sparkles: I wanted two objects to slam together really fast, but they just slid past each other, What'd I do wrong? KAGE: sometimes it's hard to aim small objects precisely enough for a high-speed collision. you didn't do anything wrong, sparkles! a + b: Huh. Mine, too... Also, I think I understand AI way better now. miniMAL: I finally jumped into the Comic MakerMatic, all ready to get drawing, but I got NO ideas. NOTHING! andboom: I'm glad I'm, not the only one, miniMAL. I've been practicing by importing comics and just changing the 4th panel. Do comics really NEED art? miniMAL: I'm sooooo bad at drawing! Why did I ever think I could be a comic artist? andboom: Did you forget that the Comic MakerMatic has stamps? Who needs drawing ability with those around? D.I.Why: Why DID you want to be a comic artist, miniMAL? andboom: Try importing some comics and replacing the text. You won't have to mess with art at all! MakerMatic hits the big time! D.I.Why: I heard that almost all games now are made with the MakerMatic engine! MeOWza: I think everything in D.I.Y. Shop is, yeah. VROOM: Just heard a rumor that Jimmy T. and Mona of Diamond Software used to work at WarioWare, Inc.! VROOM: Just heard a rumour that Jimmy T. and Mona of Diamond Software used to work at WarioWare, Inc.! Sparkles: I just LOVE Ashley's records! I've been coming up with lyrics for them and singing in the shower! D.I.Why: I'd love to hear your singing sometime, Sparkles! yogaguy: Yeah Sparkles live and in concert! Smoth: The NinSoft Store on Nintendo WFC has design challenges! They set themes for you to make games on! foe-vine: What happens if you win? 123POP! : Winning games get made available in Theme Games! Fame and fortune, whoo! Sparkles: There's a dojo hidden inside WarioWare, Inc.! flour: Diamond Software makes THE best games! Especially Mona's stuff, for some reason. Her titles are always big fun for me! Javier: The company president is a guy named Manager Joe. Phonee: Wow! Leave it to Javier to have all the obscure trivia! AAAaaah: I like listening to records on the Jukebox, but I can't make a playlist. Any ideas? T-shirts: Try importing your fav records into the Record MakerMatic, then ship them to a specific D.I.Y. Music section and arrange their order on the shelf. It's kinda like a playlist. AAAaaah: I wanted to make a game where lasers shoot from a rocket that moves up and down...but I couldn't make the rocket move right. Oh, well--my friend liked it better holding still! a + b: I'm so glad you can import your finished stuff back into the MakerMatic and fix it if you find a bug. Anyone else do that? T-Shirts: You're doing it wrong. Try bug-checking BEFORE you ship your games. A product recall just hurts your sales. I'm goin' for the big time! miniMAL: i've been making lots of comics and have decided to submit one of them to a magazine! with any luck i'll win an award and go pro! andboom: I'm rooting for you! Sparkles: I finally got the courage to enter a game in a challenge! I hope it gets selected and you all get to play it! I'm so nervous, though! D.I.Why: Don't be!!! You'll win and I'll be the first to download it!!! AAAaaah: A friend made this AWESOME game for my birthday where I get to pop a party popper! He's the best! D.I.Why: Touching. I might cry. T-shirts: Don't listen to D.I.Why. That's a good friend! AAAaaah: I want to get into game making, but I just… can't. Why can't games just make themselves?! VROOM: Dude, the whole point is to be creative--so create! VROOM: Well, the whole point is to be creative--so create! AAAaaah: Game ideas! Why don't you live in my head already?! T-shirts: I feel your pain, AAAaaah. T-shirts: Try to make it really clear where the player should tap! It totally helps! VROOM: Oh, like, making your objects stand out from the background? Yeah, that's HUGE. D.I.Why: Whoa. Deep stuff, dudes. a + b: I've been learning a lot from checking the AI of games I like. It's awesome research! John Sun: Hey, I just noticed that the game cartridge and label colors affect the color of the frame around the game when you play it! VROOM: Yeah, I knew that, too. Same deal with comics. T-Shirts: I get where you're coming from, AAAaaah! @KAGE: Asking my friends ruins the surprise! T-Shirts: It's easy to get carried away and make games too hard. Keep it fair, guys! VROOM: This. As the designer, what seems easy to you may be really tough for someone trying it for the first time. T-shirts: Remember that the Game Blender keeps speeding things up. If you can't beat your game at the highest speed, adjust it. T-shirts: Hey, right-handers! Do the right thing (ha!) and make your games easy for lefties to play, too! Lefties, you do the same thing but opposite, OK? T-shirts: Making games alone is fun and all, but going against a friend to see who can make the better game is a blast! VROOM: Niiiiiice. Totally gonna try this. John Sun: Any creators out there wanna compete with me? SureTire: All my games seem to play the same. It's boring! T-shirts: Import a game into the MakerMatic and make a few versions by tweaking the rules/graphics just a little. Put all the variations in the same section and play them in the Game Blender. You won't know WHAT to expect! John Sun: Just press OK without entering anything. MakerMatic'll do it for you! Javier: you can use the +Control Pad or the A, B, X, and Y buttons to move your field of view? Phonee: Whoa! There's Javier, making everything more awesome again! Javier is THE man! a + b: If you hold the L or R button down, you can draw really straight lines or shaped that fit the guidelines. It works with stamps too! flour: Hey, that's cool! Thanks for the handy-dandy tip! flour: If you want to make an object slowly face away, you can use the spray eraser tool to erase some, copy it to the next cel, erase some more, and so on! MeOWza: Try this: Cover the canvas completely in black. Then pick the rainbow palette and draw over the black with a pen! It's like a goth rainbow! Do I smile or cry? John Sun: Mind...BLOWN! Try making a game with the title Mario Paint! I'd tell you what happens, but you just gotta see for yourself! Javier: You can change the tracks with up/down on the +Control Pad or the X and B buttons, and mover around inside the track with the left/right or Y and A buttons. Phonee: Cool, it works! I love you, Javier! Any luck with Hum mode? flour: Anyone have hints for Hum mode? My note markers never turn out the way I want them! KAGE: close your mouth and let the sound come out your nose. in other words, hum. flour: Hey. that really helped! Thanks! Javier: If you've got a track that you aren't using but want to save, you can set its volume to zero and keep it for later. Phonee: How about that! Javier comes to our rescue again! John Sun: If you change instruments, be sure to play the phrase back so you hear what it really sounds like. Phonee: Captain Obvious reporting for duty! BREAKING NEWS: water is wet! Film at 11! MeOWza: I was making music and noticed creepy little...things running around on-screen. Anyone seen this? Javier: Maybe it's time to take a break--your eyes are playing tricks on you. Phonee: Javier's right--you're just seeing things. Javier: If you're having trouble re-creating your favorite tune, break it down. First, lay down your notes, paying attention to pitch. Then go back and move the notes left and right until each one is timed right...easy. Phonee: EPIC WIN! Javier, you're a genius! Smoth: With Wii, you can play any MakerMatic game on a TV! Big screen, baby! 123POP! : Confirmed! Download WarioWare: D.I.Y. Showcase from Wii Shop Channel! Play your games on your TV!!!!! Smoth: With the WiiWare title "WarioWare: D.I.Y. - Showcase", you can play MakerMatic games on a TV! 123POP! : Confirmed! I got it on the Wii Shop Channel! My games look so cool on TV! Smoth: I heard there's like 72 more games by Wario-Man Software in WarioWare: D.I.Y. Showcase on Wii. foe-vine: 72 games?! That's like five and a half baker's dozens! 123POP! : Plus, you can transfer those to your DS too! Smoth: I heard there's like 72 more games by Wario-Man Software in WarioWare: D.I.Y. - Showcase on Wii. How many can you send? foe-vine: In D.I.Y Showcase on the Wii, how many games can you send from the DS? 123POP! : All aboard! You could use it as extra storage when your D.I.Y Shop fills up! foe-vine: In Warioware D.I.Y. - Showcase on Wii, how many games can you send from the DS? foe-vine: I've been wondering—how do you play games on the Wii version? There's no Touch Screen! Smoth: Easy. You move a cursor with the Wii Remote and press the A button instead of tapping. John Sun: If you've got D.I.Y Showcase on your Wii, you can "play" your records in a different way! I've got one that's not a catchy song, but a great level! Anyone interested in hearing about it? D.I.Why: Anyone else think T-shirts might be a real game developer? 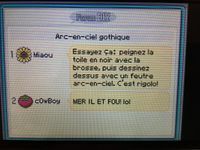 In the French translation of WarioWare D.I.Y, blobmob's response in the "Gothic rainbow" thread is "MER IL ET FOU! lol", a reference to an infamous meme in the French video game community. This page was last edited on January 22, 2019, at 12:25.